This procedure should be used with care! 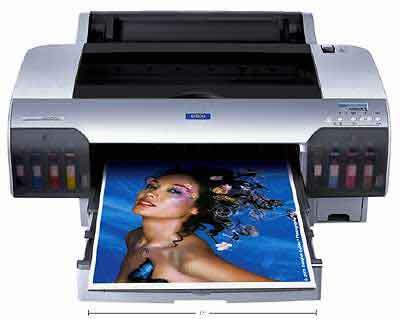 Warning – getting this wrong could well mess up your printer, so do it at your own risk. This info is from Lyson and they won’t take responsibility for damage either! Press and hold the < + ^ + > buttons and power up the machine. When the LCD display shows SELF TESTING, release all buttons. Press ¥ until you see SERVICE CONFIG on the display. Press > once, the display will read CHG DEVICE-ID. Press ¥ until the display shows ED MODE. The printer will power up and show ‘Ready’ with (0XXXXXXXX) at the ink cartridge status bars. This setting is written to the printer eprom and won’t change when the power is switched on and off.